The News app on iPhone and iPad includes a large number of publications, some of which you may be interested in, and likely some that you have less interest in reading, or maybe even some news you don’t want to see at all. Fortunately it’s really easy to adjust the News app in iOS to block or hide a news source, so if you’re tired of seeing stories from a particular outlet or a trashy tabloid source you can hide them and clean up your News app feed a bit. This offers a simple way to customize the News app to better suit your preferences, and to hide all stories and publications from media outlets you either aren’t interested in or just don’t like. Whether or not you can “Dislike Channel” or “Mute Channel” in News app depends on which version of iOS you have installed on the iPad or iPhone. However it is worded, you can hide stories from any News channel this way. 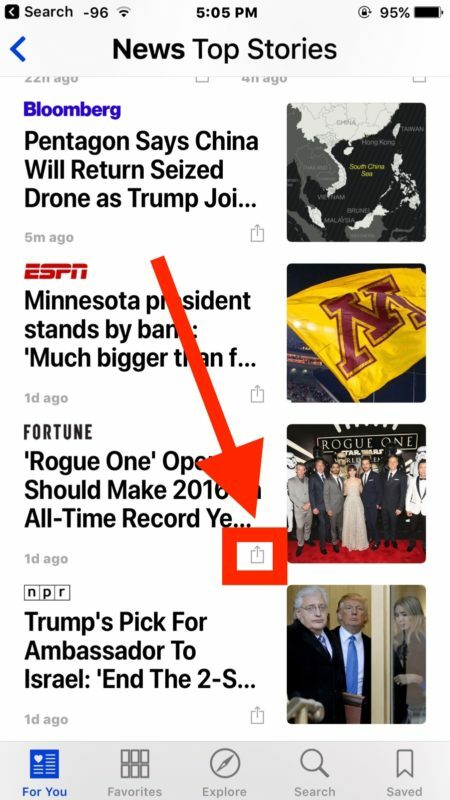 This offers a way to clean up and adjust the Apple News curated feed a bit to better suit your preferences, and it makes it easy to hide some of the junkier sources found in News. 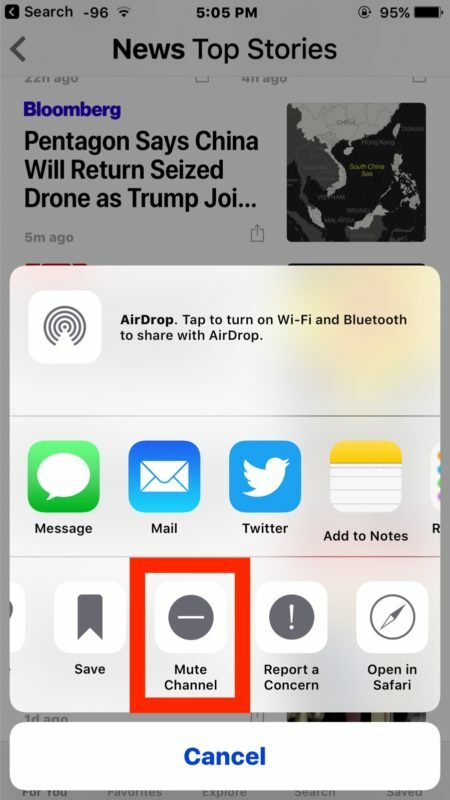 The Apple News app is sort of embedded throughout iOS now, showing up on your iOS widget lock screen, Spotlight search, and the prominent out you can also remove News headlines from the Spotlight search screen in iOS or just delete the News app completely now that you can easily remove default apps on an iPhone or iPad. Is this “News” app country specific? I live in South Africa and the app is not on my iPhone (iOS 10.2) nor on the App Store. Deleted the News app all together. Too much news about the woman abusing orange troll king. But what do you do when a new did channel still shows up in the feed? I muted a channel and yet it still shows up in the stories for you widget. When I tap on it and hit the share button there is no like, dislike, or mute channel that comes up. So I muted CNN and VOX each time I open the news feed CNN and VOX still are showing? I made sure to close the app completely. Do I need to reboot? You can no longer remove any news source from Apple news. In fact, any news agency you dislike will automatically appear first. The only possible way to stop being forced to read the articles you hate the most is to delete the News app completely, which is what I did. Dave, for News app on iPhone or iPad, you can hide, dislike, or block a news channel source easily following the instructions outlined here. When you choose to block a news channel, all news from that source will be hidden. This applies to iOS News app only. same here. Disliked the fake news channel and now it’s all I see. Installed dedicated news feeds from reliable sources instead. Widget no more. Tried to make small donation, but after entering all info THEN privacy & terms & conditions were offered. No thanks–but my little $$ had already hit my account. Now I get this diarrhea dribble of young guys with gender anxiety. Time to delete what brief exposure to The Guardian seemed desirable, but not, & herein share the learning to save other trusting souls. This doesn’t work. The only similar option I’m given when I click that box with the up arrow, is Dislike Story. I’m tempted to delete the app as others here have done. Fox does not follow any journalistic standards. It’s crazy Apple includes it in an attempt to appease the red hats.